Barry Jean Ancelet is a native Louisiana French-speaking Cajun, born in Church Point and raised in Lafayette. He graduated from the University of Southwestern Louisiana (now the University of Louisiana at Lafayette) with a BA in French in 1974. He received an MA in Folklore from Indiana University in 1977, and a doctorate in Études Créoles (anthropology and linguistics) from the Université de Provence (Aix-Marseille I) in 1984. He has been on the faculty at UL Lafayette since 1977, first as Director of the Center for Acadian and Creole Folklore, and later as a Professor of Francophone Studies and Folklore in the Department of Modern Languages, which he currently chairs. In 2005, he was named Willis Granger and Tom Debaillon / BORSF Professor of Francophone Studies. He has given numerous papers and published numerous articles and several books on various aspects of Louisiana’s Cajun and Creole cultures and languages, including One Generation at a Time: Biography of a Cajun and Creole Music Festival (Lafayette: UL Center for Louisiana Studies, 2007), Cajun and Creole Music Makers (formerly The Makers of Cajun Music ; revised edition, Jackson: University Press of Mississippi, 1999), Cajun Country (Jackson: U Press of Mississippi, 1991), and Cajun and Creole Folktales (New York: Garland Publishing, 1994), as well as two monographs, Capitaine, voyage ton flag: The Cajun Country Mardi Gras (Lafayette: UL Center for Louisiana Studies, 1989) and Cajun Music: Origins and Development (Lafayette: UL Center for Louisiana Studies, 1989). He is a member of the team, coordinated by Albert Valdman of Indiana University, that produced the Dictionary of Louisiana French as Spoken in Cajun, Creole and American Indian Communities (Jackson: U Press of Mississippi, 2009). With Carl Lindahl and Marcia Gaudet, he edited Second Line Rescue: Improvised Responses to Katrina and Rita (Jackson: U Press of Mississippi, 2013). He is interested in expanding the classroom through festivals (including Lafayette’s Festivals Acadiens et Créoles, which he directs), special concerts, records, museum exhibitions, documentary films, and television and radio programs. He has served as a consultant and fieldworker for several documentary films, including Pat Mire’s Dance for a Chicken: The Cajun Mardi Gras and Anything I Catch: The Handfishing Story, Karen Snyder’s Cajun Crossroads, Alan Lomax’s Lache pas la patate: Cajun Country, André Gladu’s Zarico Yannick Resch’s Les Cajuns, Chris Strachwitz’s J’ai été au bal: The Cajun and Zydeco Music of Louisiana, and Glen Pitre’s Good for What Ails You, as well as Côte Blanche’s Conteurs de la Louisiane radio storytelling series. He served as associate producer, along with Zachary Richard, and principal scholar, along with Carl Brasseaux, for Pat Mire’s Against the Tide: The Story of the Cajun People of Louisiana, a production of Louisiana Public Broadcasting and Louisiana’s Department of Cultural, Recreation and Tourism. He served as director of the team of scholars that provided the basic research to the National Park Service for the development of the Jean Lafitte National Park’s three Acadian Culture Interpretive Centers. He is a Chevalier in France’s Palmes Académiques and in France’s Ordre des Arts et des Lettres, a member of Quebec’s Ordre des Francophones d’Amérique, and a Fellow of the American Folklore Society. In 2009 he was named Humanist of the Year by the Louisiana Endowment for the Humanities. Sam Broussard was signed to Capitol Records in 1971 as part of the adventurous acoustic quartet of Louisiana boys called Manchild. As a teenager he shared the stage with the likes of Ramblin’ Jack Elliot, Sonny Terry and Brownie McGee and Dave Van Ronk. He went on to do studio and roadwork with Michael Martin Murphey, Nicolette Larson, Foster and Lloyd, Jimmy Buffett and countless others during his stay in Nashville. During his Colorado days he often played with Robben Ford: “I kept up with him a few times.” In the mid-90’s he toured Europe, recording, filming and writing with million-selling franco-swiss star Stephan Eicher. Since 1958 the Ville Platte–based Swallow Records and its subsidiary labels have released a wealth of Cajun, zydeco, and swamp-pop classics. Despite this extensive catalogue it is unlikely that anything in Swallow’s vast vaults bears much resemblance to its newly released “Broken Promised Land”—a brilliant, edgy, genre-defying album by Barry Jean Ancelet and Sam Broussard. Ancelet has devoted his eminent career to the study and documentation of French Louisiana’s cultural, linguistic and folkloric traditions, and their connections with the rest of the French-speaking world. Accordingly it may seem like a radical departure for him to contribute all the lyrics, and four lead vocals, to this startling project produced by Broussard. 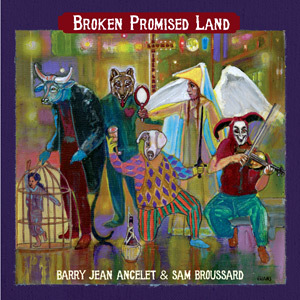 “Broken Promised Land” encompasses art-rock, electronic music, and futuristic abstract soundscapes, as well as syncopation and poly-rhythms, passages of jazz and classical music, searing guitar solos, exquisitely subtle interludes, and the distinct influence of both The Beatles and The Band, alongside Cajun music, zydeco and country. In addition to this improbably rich mélange, some of the songs’ structures—the poignant “Appuyé dessus la barre,” for one—take fascinatingly circuitous paths before harmony and melody resolve at the end of each verse. For a sense of how this freewheeling approach holds together, consider the album’s opening song, “Conte de faits.” It starts with bluesy guitar chords and stinging single-note licks played over ambient effects that suggest both howling winds and police sirens. These fade, but the guitar builds throughout the intro and continues after Broussard’s vocal comes in. His first verse is followed by a lengthy guitar solo with dramatically increasing intensity, underpinned by the introduction of a drumbeat with a metallic/industrial sound. Broussard plays the latter part of this solo over descending figures provided by a horn section that appears unexpectedly, contributes its part succinctly, and then vanishes. The second verse finds Broussard singing at full throttle, accompanied towards the end by back-up vocals with a gospel-music tinge—and then the song abruptly stops cold. Broussard demonstrates national-level production skills by binding these disparate and wildly imaginative strands into a cohesive whole. The most dramatic examples are “Conte des faits,” “Trop de pas,” “Personne pour me recevoir,” and “Pour qui?” Other songs unfold in a more straightforward manner that reveals a core of Cajun music, zydeco, and country. The result is an ambitious yet fully realized project that is unique in the history of French Louisiana’s music. Appearing less than a year after the release of “I Wanna Sing Right: Rediscovering Lomax in the Evangeline Country” (see Sound Advice, Spring 2016)—which was also groundbreaking, in a different sense—“Broken Promised Land” underscores the impressive musical creativity that is absolutely surging today in southwest Louisiana. 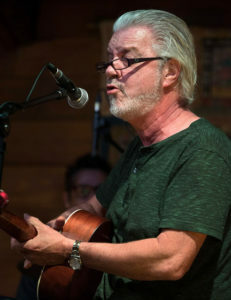 Broussard, who currently plays guitar with the Cajun band Steve Riley and the Mamou Playboys, is a multi-instrumentalist, a bilingual singer and a songwriter with decades of professional experience in the United States, Europe and Africa. He has released two solo albums, “Veins” and the critically acclaimed “Geeks.” Broussard sings lead on six of the songs here, and his expressive voice can run the gamut from plaintive (“Personne pour me recevoir”) to urgent (“Conte des faits”). Ancelet can likewise range from wistful (“Appuyé dessus la barre”) to ominous (“Le loup”), as the moment demands. Anna Laura Edmiston contributes a gorgeous vocal on the pensive waltz“Coeur Cassé.” Broussard plays almost all of the instruments here, overdubbed, with David Greely and Gina Forsyth adding fiddle parts and Christine Balfa and Danny Devillier making rhythmic contributions on triangle and drums, respectively. Broussard similarly cites ’60s music as influencing his production sensibilities: “What that era gave to me was a higher proportion of pop songs that had great lyrics and melodies, chord changes that were interesting just on their own, and brilliant instrumentation.” Broussard also “took two semesters of theory and composition a long time ago. Learning Bach four-part writing was life-changing. And,” he concludes,“I have to give a bow to our engineer, Tony Daigle” for his contributions to this technically complex project. Who had hidden in the cage. “I sometimes focus on dark themes,” Ancelet says. “I push myself into an improvised nightmare and then write out of that. But there are other issues on this album, including a condemnation of the manipulated violence in the world, a questioning of the trappings of organized religion, and an exploration of the tension between French-based and English-based identities, tradition-based and modern-based identities.” He also points to other influences that shape the album: “There’s a song written in the voice of Amédé Ardoin, and a celebration of the Creole storyteller Ben Guiné, from Promised Land, a rural area on Bayou Teche near Parks in St. Martin Parish.” These themes are additionally reflected in the surreal cover art by the gifted Lafayette painter Olin “Leroy” Evans. LCV readers who do not speak French will nonetheless find considerable substance on this remarkable album. The emotions conveyed transcend language. And the instrumental settings offer new sonic revelations with each successive listening. For decades now, retired ULL professor Barry Ancelet has written French language poems and lyrics under the pseudonym of Jean Arceneaux. 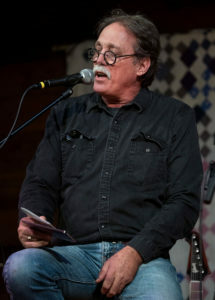 A few have been recorded, such as “Late in Life,” the 1992 CFMA Song of the Year that was co-written with Wayne Toups. The roots of this collaboration began when Ancelet gave Mamou Playboys’ guitarist Broussard some minimalist lyrics that blossomed into the electrifying “Menteur” found on Steve Riley’s 2008 Best Of disc. This set is a brilliant showcase of Ancelet’s thought-provoking poetry and Broussard’s genius arrangements. Only three tracks feature guest musicians. Broussard played everything else: acoustic, electric and lap steel guitars, fiddles, bass, harmonicas, flutes, saxes and programmed percussion all recorded in his home studio. Interestingly, for being an account of Amédé Ardoin towards the end of his life, “Une Dernière Chanson” is a surprising steel guitar and fiddle–fueled country two-stepper. The despairing loneliness of “Appuyé Dessus la Barre” is folk-centric and haunting, yet replete with a beautiful, sunny solo. To break up the vocal content, Broussard tosses in a quasi-orchestral instrumental—“Pour Qui?”—that’s simultaneously jazzy and cinematic. A rare recording that gets deeper with each and every listen.